Discover Calbayog in Samar, the city with many identities. This city is located along the coastal part of Samar province which stretches about 97 kilometers (60 miles) from the northern tip of the island and 290 kilometers (180 miles) from the southern boundary. The third largest city in terms of land and water area in the Philippines, it is the first established city in Samar Island and 19th in the country. Tagged as city of waterfalls, Calbayog is also known as a talent bank city, a city rich in history and culture, a city that is both rural and urban, and a city on the rise to progress. With natural and man-made attractions, history, heritage, culture, foods, accommodation, surely Calbayog will be your best summer escapade destination in Eastern Visayas. Getting wet in the city of majestic waterfalls is truly a summer fun activity. Bangon Falls is considered as the crown jewel of Calbayog wonders. It is a four-layered waterfall, which is considered the biggest in the city. At the topmost part is a circular pond wide enough for swimming and deep enough for diving. The water seems to come from an endless stream and forms a swirling path as it falls down the rock formations. Tourists who visit the site always comment that Bangon Falls is not just another waterfall. It is beautiful, majestic and spectacular spot worth visiting, the site is very refreshing. The falls is located in Tinaplacan village, some 45 kilometers north from the city center. Tourists can have a 15-minute single motorcycle ride traversing a steep and narrow pathway or a 45-minute hike from the village center while enjoying the scenic view. 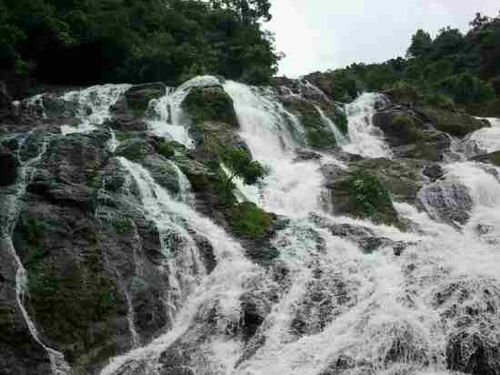 Tarangban Falls, also located in Tinaplacan village, is equally beautiful and majestic as Bangon Falls. It is a paradise for nature lovers. It has pristine waterfall that displays a unique form made by nature. Water cascades through the big rocks, putting it into a picture of a captivating landscape. Calbayog City local radio reporter Carina Comilan-Caranzo describes Tarangban Falls as a beautiful haven of paradise. “A beautiful haven of paradise, our city is so blessed of having so many waterfalls, wonderful place of nature where you can find solitude,” Caranzo said. Tarangban Falls is a one-hour hike from the village or a 30-minute hike from Bangon Falls. Waterfalls adventure in Calbayog is not complete without a tour to Pan-as Falls in Pilar village. The falls is more than just a tourist attraction for it is located in the watershed area of the city. When viewed from afar, the flowing water of Pan-as looks like a maiden’s long hair cascading down the side of a high mountain. Pan-as falls is so high that as the water reaches the pool, it transforms into a mere mist. Tabokno Falls in Caybago village can be reached through a one-hour drive from the city center and an hour-walk from residential areas. Though the site is not as majestic as Bangon, Tarangban and Pan-as, Tabokno serves as a swimming and picnic site for locals. Tourism Officer Ronald Ricafort said that although the city has no beach comparable to famous beaches in the country, Looc or Malajog Beach as attested by locals is the best, one of the most visited and beautiful beaches in the province with its clear waters. It’s grayish sand, clear blue water, towering rock formation, swaying palm trees make the site a beautiful attraction and this is where you find one of Samar’s best views of sunset. Tourist can enjoy swimming on the clean, cool sea water or kayaking. Ricafort said that what makes Malajog Beach more exciting is the fronting Daraga islet, known for snorkeling and diving. For an added adrenalin rush, you may visit Isla Pawikan (Turtle Island), also a great place for snorkeling and diving activities. It is an islet located off the coastal villages of Manguino-o, Banti-an and Binaliw in Tinambacan district. It is referred by locals as Turtle Island due to its form which resembles that of a turtle. Located 40 to 50 meters below the waterline and measuring approximately one hectare is an area that holds the potential for deep sea diving, the islet is surrounded by uniformly and equally spread aquifers. Beneath the deep waters are variety of sea corals, rare white pebbles, various types of sea shells and ornamental aquamarine species. You can hire locals that are trained as snorkeling and diving guides on your visit. Calbayog is also home to the best tinapa (smoke fish) in the region. Visit to the city is not complete without taking home tinapa as pasalubong, a tradition of Filipino travellers of bringing gifts from their destination to people back home. The city’s tinapa tastes fresh and really good. Some says that the clean waters from Samar sea enhances its savor. Others believe that it is the process by which the product is made that makes a difference. Calbayog is considered as the gateway of the province. For those coming from Manila, you can take a one-hour-and-a-half flight to the city or if you are an adventurous traveller, you can take a 19-hour bus ride. If you are travelling from Cebu, you can take an overnight or eight-hour boat trip. Tourists from Tacloban City, the regional capital, can take a three-hour van or bus trip. Wherever you come from, one thing is for sure, Calbayog is a place worth visiting.